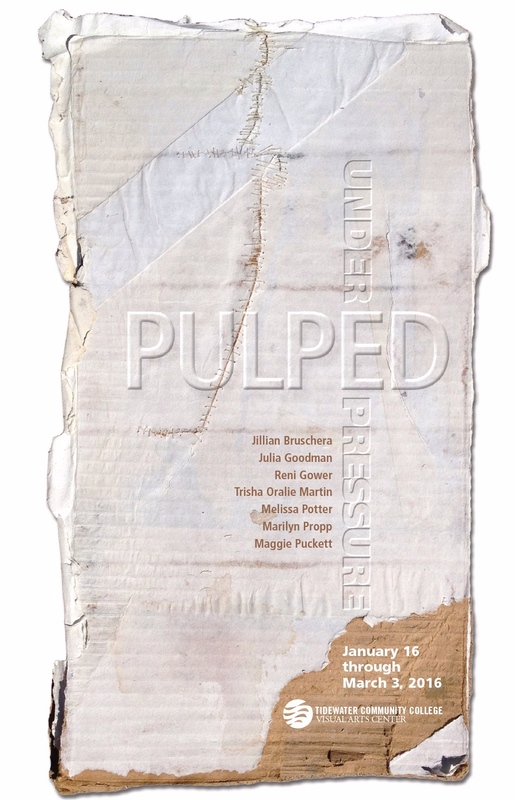 Co-curated by Reni Gower and Melissa Potter, Pulped Under Pressure features work by seven female artists: Reni Gower, Melissa Potter, Jillian Bruschera, Julia Goodman, Trisha Martin, Marilyn Propp and Maggie Puckett. Work is made from material such as junk mail, egg cartons, and heirloom plants in printmaking, letterpress, papercutting and installation works. With traditional hand papermaking at its core, the exhibition underscores important contemporary issues steeped in history and craft. Enticed through touch, these works encourage a contemplative slowing down even as they urge acknowledgement of some of the most pressing issues (environmental crisis to global marginalization) facing civilization today. Exhibition card for Pulped Under Pressure.